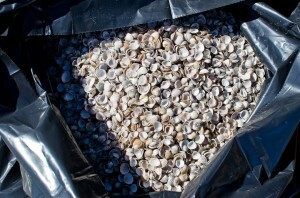 On Course Events, 5 volunteers, and the Sand Sifter 200 lbs of litter & 30 lbs of Asian clam shells from Lakeview Commons. Photo Credit Lauren Lindley. Every Monday morning, the producers of the Live at Lakeview Summer Music Series (On Course Events) gathers its staff and a few volunteers to clean up the beach, park, and surrounding neighborhood areas of Lakeview Commons. 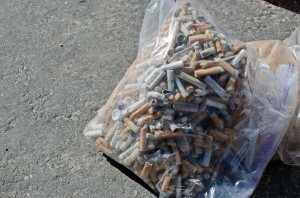 On average, the group collects approximately 15-25 lbs of trash each week. After getting rained out with thunderstorms on Thursday, July 25th and being forced to move the concert down the street to Tep’s Villa Roma, the On Course Events crew remains dedicated to the weekly cleanups and invited Bruce Hernandez to join in with the Sand Sifter machine. This machine collected 165 lbs of trash and 30 lbs of Asian clam shells with two passes across the sand in about 1.5 hours. Volunteers collected another 35 lbs of trash by hand, throughout the morning.The most common items picked up from both the machine and our volunteers included: cigarette butts, bottle caps, and wrappers. Some of the more surprising items included a bike, diapers, and a beach ball. 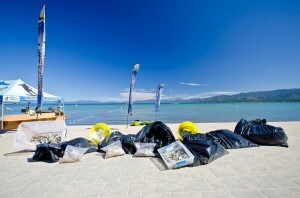 Volunteers are encouraged to join the weekly beach cleanup efforts to keep our beaches litter free and to keep Tahoe blue. Those interested in joining can meet at Lakeview Commons every Monday morning through September 2nd at 10:00 am. Buckets, gloves, and trash bags will be provided. 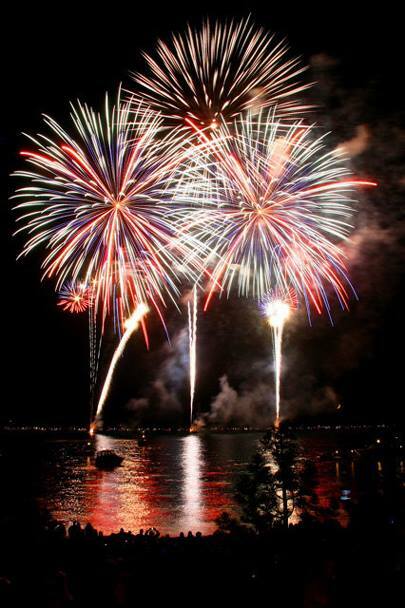 In celebration of Independence day, the Live at Lakeview crew will be taking this Thursday off to enjoy the festivities and, of course the fireworks. There will not be a Live at Lakeview concert or a Live AFTER Lakeview party this week. Don’t worry, we promise to bring all the fun times back the following Thursday, July 11th with Naive Melodies and special guest, Ashley Kepler! Plan on spending every Thursday through the end of August with us at Lakeview Commons! For this Thursday, we wish you a super fun and SAFE holiday weekend! Our crew will be enjoying our only Thursday off for the season and we look forward to seeing you next week! The Live at Lakeview Summer Music Series kicks off summer on June 20th with Tahoe Action’s Best Band of 2012, Jelly Bread and special guests 4 Piece Puzzle. This popular event series is returning in a big way, with a larger stage, larger beer garden, and a much larger FREE bike valet. 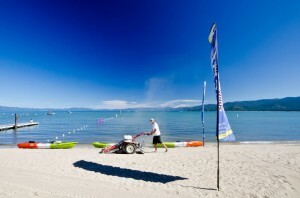 Thanks to Shoreline of Tahoe, this seasons’ Bike Valet Sponsor, we will be offering more space for your bikes. Parking is limited; with off-site locations available at the SLT Recreation Center (1601 Rufus Allen Blvd.) Bike or hike! 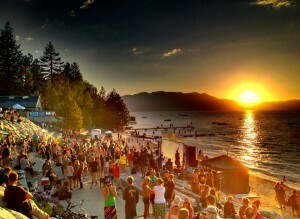 With an average of 1500 people gathering in Lakeview Commons and over 200 bikes coming through the free Bike Valet each Thursday night; it’s no secret that the Live at Lakeview Summer Music Series quickly became the pinnacle of South Lake Tahoe’s summer of 2012. On behalf of the entire On Course Events crew, I want to say THANK YOU to all of you who came out, week after week, to support these community events! We couldn’t have made these free concerts a reality without support from the local community! We have already begun planning for next summer and we’d love to hear from you! After all, these are your community events (we just produce them!) We want to know all about your Live at Lakeview experience and any other feedback you’d like to share is much appreciated. Please take a few moments and write On Course Events a brief email on your thoughts, experiences, and suggestions for the Live at Lakeview Summer Music Series. Thanks again for all your support and we can’t wait to hear from you!! It’s been a summer filled with spectacular live music and great family fun as the Live at Lakeview Summer Music Series made Lakeview Commons come alive! 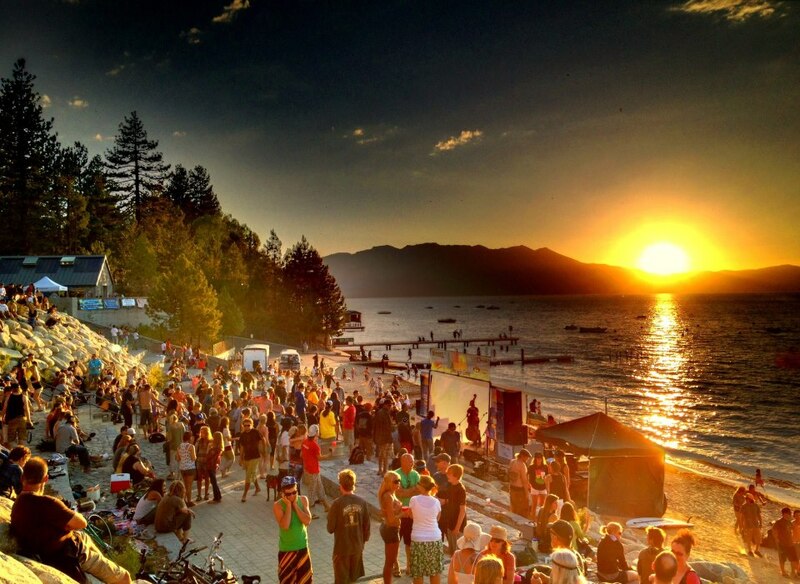 In its’ first year of production, this free concert series quickly became the pinnacle of South Lake Tahoe’s summer of 2012. Large audiences of 1500-2000 people gathered each Thursday to enjoy a variety of talented musicians rocking the Live at Lakeview stage along the shore of Lake Tahoe. On Course Events, the producers of this concert series showcased local and regional musicians, as well as a lot of new bands that have never played in Lake Tahoe before. Every Thursday this summer, Live at Lakeview brought a little something for everyone to enjoy – from the bluegrass tunes of Fruition, to the local talent of The New World Jazz Project with Trey Stone, and ending with a huge reggae star, Elan, the former lead singer of The Wailers! On Course Events has not only provided free live music, it produced a weekly summer event where the local community could come together to enjoy this beautiful place we all call home. A strong community vibe was present every Thursday as thousands gathered in the brand new Lakeview Commons. On Course Events has remained committed to keeping these concerts sustainable and limiting the environmental impact. This was accomplished with a variety of actions including: offering a free bike valet, helping environmental non-profit organizations raise money, and spearheading weekly beach and neighborhood clean ups. (Join us for the last one this Monday, September 10th at 9am). The free bike valet was operated by local non-profit organizations each Thursday, housing an average of 250 bikes per week. The demand for the bike valet exceeded the space each week, no matter how large we made it. In fact, during the 12 week concert series, the bike valet held over 3,000 bikes! 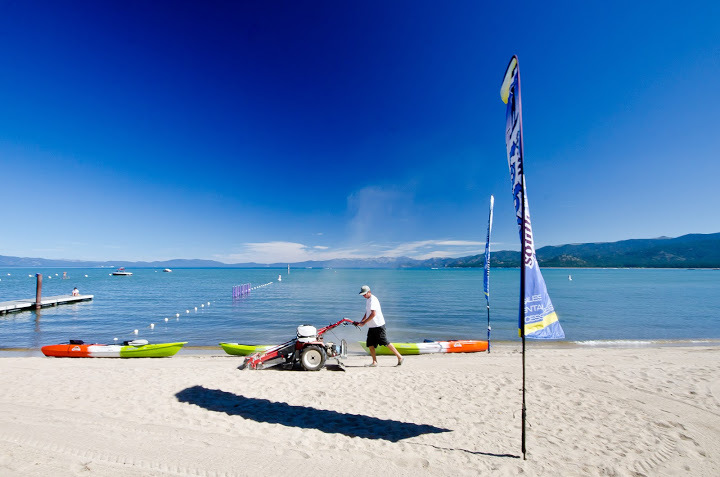 Along with accommodating thousands of bikes, the bike valet also served as a fundraising opportunity for local nonprofit organizations including The League to Save Lake Tahoe, The Sugarpine Foundation, USASA, and Tahoe Youth & Family Services. The entire Live at Lakeview crew has been overjoyed with the immense amount of support we’ve received from the local community. Thank you all for your support, as these concerts wouldn’t have been possible without the local sponsors and vendors including: Lake Tahoe TV, KRLT/KOWL, Coors Light, Pet Projekt, Tahoe Production House, Sprouts Natural Foods Café, Lake Tahoe Community College, Mountain News, and many more! What’s next for Live at Lakeview? Stay tuned to www.Lakeviewcommonslive.com and the official Live at Lakeview Facebook Fan Page for information on summer 2013 concert schedule! This Thursday, be ready from some new music guaranteed to get you feet movin’ and your booty shakin’! We are beyond stoked for The Polyrhythmics to bring some funk to the Live at Lakeview Summer Music Series! The energy of this all original 8 piece-funk and world beat orchestra from Seattle is expected to overflow off of the stage and ignite the dance floor! The Polyrhythmics sound is a fusion of styles from all over the world. According to Ben Salmon, from the Bend Bulletin, “Take a polished, modern brand of funk, flavor it with a little Afrobeat swagger and Latin rhythm, and inject a spirited, powerhouse horn section and you’ve got Polyrhythmics.” Their music has heavy influences including: James Brown, Budos Band, The Whitefield Brothers, Quincy Jones, Miles Davis, Michael Jackson, and Talking heads. These guys are nothing short of spectacular on stage and they really offer something for everyone! From the tight horn lines, infectious percussion, down to the powerful rhythmic grooves, and clever arrangements – The Polyrhythmics will grab your attention and get the venue jumping! Let’s give The Polyrhythmics a true Tahoe welcoming and show them what Live at Lakeview is all about! Most importantly – let’s get funky! !